Forget what the playbook says: tailgating starts at the gate. Seattle football fans flying to the regular season opener in Denver are in for a treat this Friday. 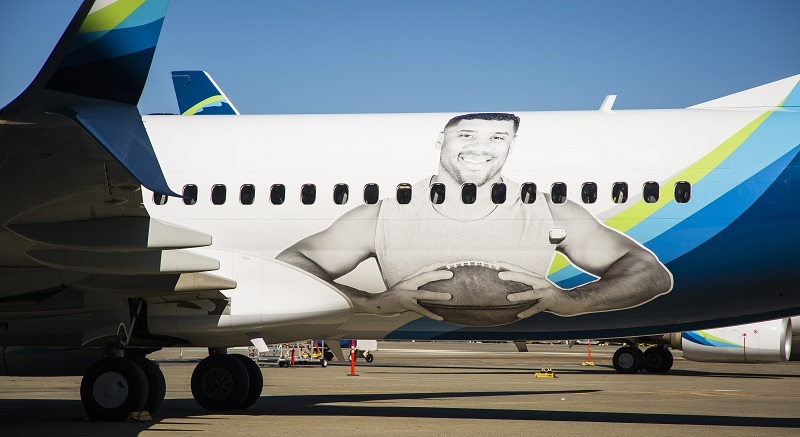 Gate C9 at Seattle Tacoma International Airport will be decked out in blue – and a new Russell Wilson plane will be waiting at the end of the jetway. The Boeing 737-800 features Wilson’s tagline, “Dream Big. Fly High.” above the aircraft door. 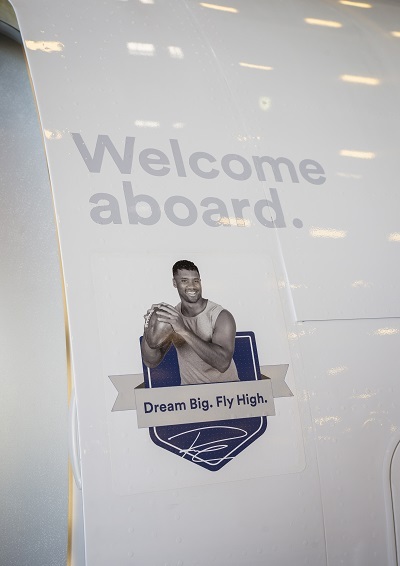 The tagline is a reminder of what our partnership with Seattle’s star quarterback is about – celebrating our hometown football fans and building a strong local community. Through the Russell Wilson Passing Academy, Wilson hosts a football camp to develop young players. 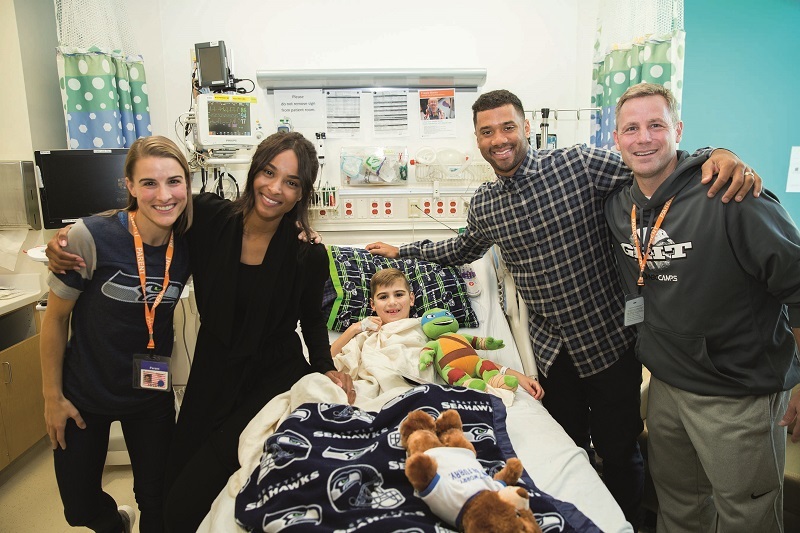 But football isn’t the only way he coaches kids; Wilson volunteers regularly at Seattle Children’s hospital as part of the Strong Against Cancer campaign to end childhood cancer. At his core, Wilson believes in possibility, in drive, and in the underdog. He believes everyone is capable of whatever they set their mind to if they set clear goals, surround themselves with positive influences and choose their future. In 2014, this drive led Wilson to launch the Why Not You Foundation. The goal is to empower and inspire kids to dream big, believe in themselves and have a “why not you” attitude. The foundation raised nearly $1.4 million while hosting a concert featuring Ciara, Macklemore, Ryan Lewis and the Seattle Symphony at Benaroya Hall this past May. 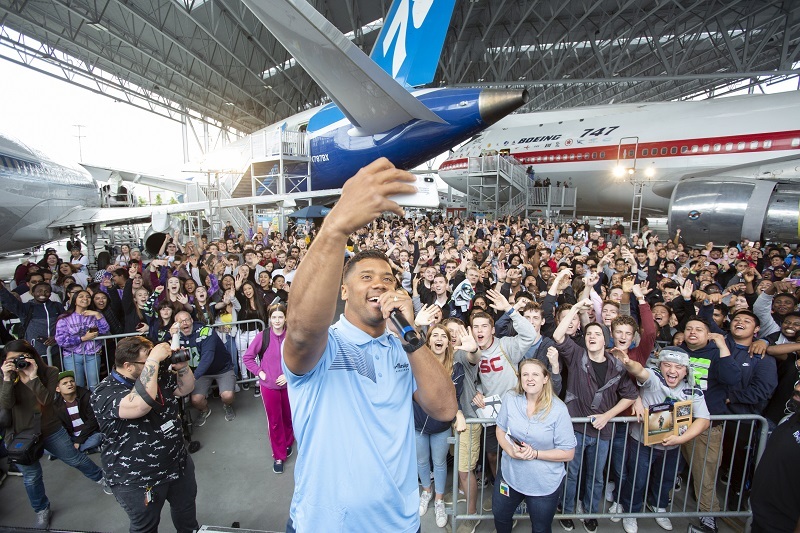 The Chief Football Officer has also joined Alaska Airlines’ annual There’s No Time to Sleep event in South Seattle’s Highline Public Schools district. The event aims to help high school graduates define their goals and pursue their dreams. At this year’s event, Wilson surprised 13 young leaders with college scholarships. These kids are future community organizers, scientists, engineers and nurses – and some will be the first in their families to attend college. Afterwards, one young woman handed back her check because she wanted to support someone who needed it more. Her selflessness and Wilson’s drive give us hope. In fact, Wilson’s interest in education and youth development was a major reason Alaska forged and extended a multi-year partnership with the quarterback. As dedicated as Wilson is to charitable work, he is also committed to a future beyond football as an investor and business owner. In 2017 he started TraceMe, a company focused on connecting fans to athletes and celebrities, with Amazon founder Jeff Bezos, Alibaba co-founder Joe Tsai and YouTube co-founder Chad Hurley involved, as well. He co-founded the Good Man Brand men’s clothing line in 2016, launched West2East Empire, a brand-management company, and holds equity interests in Luvo (a frozen-food company), Juice Press (an organic food company) and The Players’ Tribune (a media company that gives athletes a platform for connecting with fans, founded by Wilson’s favorite athlete growing up, Derek Jeter). Such varied interests, each embraced with the same level of passion Wilson exhibits on the field, have earned him a high level of respect. As he looks forward, Wilson says he’s grateful for experiences that will help him be a better leader, athlete, husband and father. This story is adapted from the September 2018 Beyond Magazine cover story by freelance writer Jim Caple. Top image by Rochelle Bergstrom.